Before settlers from Europe arrived in the Americas, southeastern Pennsylvania and much of New Jersey and Delaware were inhabited by a group of Native Americans named the Lenni Lenape. This group was stationary and relied on agriculture, as well as hunting, gathering, and fishing. During the 17th century, the Lenni Lenape attempted to capitalize on the fur trade, selling to Dutch colonists to meet high demands from Europe. As a result of these interactions with European traders, populations of the Lenni Lenape drastically shrunk during the colonial era, primarily due to disease, but also because of wars fought with neighboring tribes who had acquired firearms. William Penn was the first to lay official claim to land in the Mid-Atlantic region after it was gifted to him from King Charles II of England. Upon his arrival, he attempted to make peaceful deals with the Lenni Lenape, and was known for his compassion and compromise. Despite this, the presence of yet more settlers inevitability exacerbated the demise of the Lenape. Today many testaments to the colonial era are still recognizable; many of the streets, towns, and landmarks throughout the Delaware Valley are named in the likeness of Native American words and, most prominently, in the very center of Philadelphia, William Penn stands atop of Independence Hall. During the Revolutionary War, Philadelphia served as an important port city, as well as a meeting places for revolutionary influencers. The first and second meetings of the Continental Congress were held in Philadelphia, followed by the signing of the Declaration of Independence in 1776. For history buffs, visiting these sites is a must while visiting Philadelphia. Luckily, much of this history has been preserved and is open to the public to see. For the Liberty Bell, visit Independence Mall and the Liberty Bell visitors center. For a tour of the Declaration of Independence signing room and birthplace of the U.S. Constitution, visit Independence Hall, directly across from the Liberty Bell. There are numerous history-related trails and tours throughout the city. 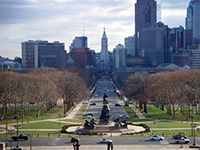 After the Revolutionary War, Philadelphia was named the temporary capital of the United States until 1800, while construction began on a new capital in Washington, D.C. In the early 1800s, with trade embargoes and the War of 1812, the port city of Philadelphia was forced to slowly abandon its shipping industry and embrace manufacturing, setting the stage for the plentiful arrival of immigrants from Europe. During the nineteenth century, immigrants flocked to Philadelphia, mainly from Europe, with large populations from Ireland and Italy. These groups settled around the city forming close-knit communities across ethnic lines. The early twentieth century brought yet more people to the city, including African Americans from the South. In the mid 1900s, Philadelphia experienced a housing crisis as the wealthy middle class moved to the suburbs and manufacturing jobs moved elsewhere. This brought change to the city as preparations began for the bicentennial and a renewed focus on infrastructure. The late twentieth century brought more change to the city with crackdowns on drugs and gang violence, as well as continued development. By the 2000s, revitalization of the city was in full swing with several hotels, restaurants, and tourist-serving institutions popping up across the city. Today, Philadelphia is a premier tourist destination that boasts well-preserved historical sites, diverse culture, and modern amenities. In addition to the abundance of historic monuments and statues, Philadelphia is home to many other famous cultural monuments. Located at the bottom of the Philadelphia Museum of Art steps, this statue has been around since 2006 and just recently hosted a surprise visit from Sylvester Stallone. Located steps away from the Convention Center, this gate is the symbolic entrance to Chinatown and a representation of diversity and friendship between Philadelphia and its sister city Tianjin. Much of the city’s diverse and cultural history is captured in murals across the city. The Mural Arts Program does an amazing job curating and working with local artists to create meaningful pieces. Various mural tours—by foot, train, bus, and even trolley—are offered and are highly recommended! 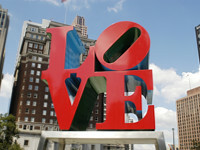 Possibly the most well-known monument or public art piece, located in John F. Kennedy Plaza. This piece by Robert Indiana was commissioned for the 1976 bicentennial. Philadelphia continues to grow and explore different ways to remember it’s history and diversity. Just last fall the city hosted Monument Lab, a collaborative project that invited residents to design and display the monuments they thought represented Philadelphia. Looking for more monuments to explore? Check out this great list from TripAdvisor.